Aromatic and fragrant. 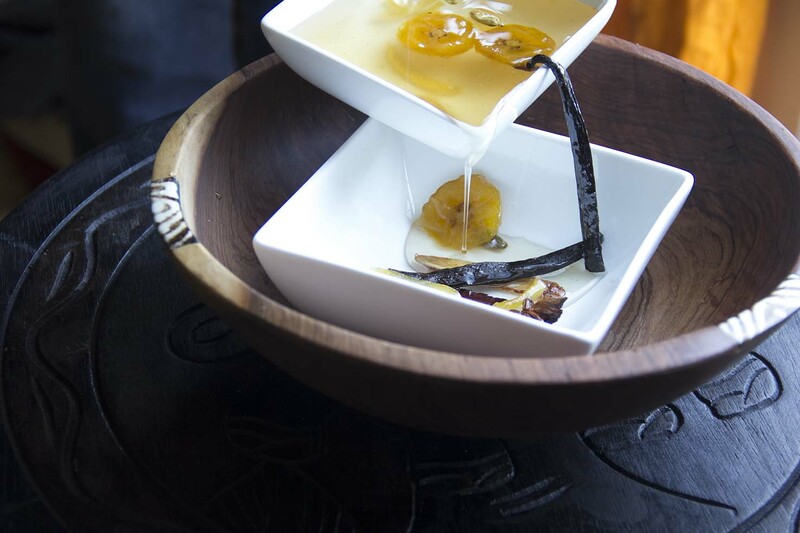 I love the winning combination of spices used by Jean-Christophe Novelli in his fabulous tarte tatin and after 3 years working at his Academy I’m hooked… Here I poach plantain in a spice syrup until they are soft and candied and serve with exotic fruits. Peel, then chop the plantain into ½ cm (¼ inch) discs. Put the syrup ingredients in a pan and bring to a boil. Once the sugar dissolves add the plantain and simmer until syrupy, allowing the plantain to poach and cook through. Remove from the heat and leave to cool then chill in the fridge, preferably overnight. Peel, core, de-seed and slice the fresh fruits and put in a shallow bowl. Drizzle with the plantain spicy syrup and serve. No Replies to "Poached plantain in spicy drizzle"